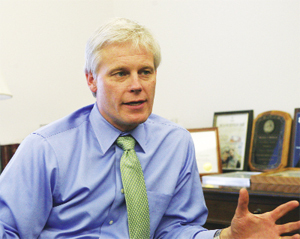 House Minority Leader Paul Thissen named five fellow Democratic representatives that will join him in leading the caucus next session. Rep. Debra Hilstrom, Brooklyn Center, was named Deputy Minority Leader. Thissen also named four representatives that will serve as Minority Whips, including Rep. Larry Hosch, St. Joseph, Rep. Melissa Hortman, Brooklyn Park, Rep. John Lesch, St. Paul, and Rep. Terry Morrow, St. Peter. Hilstrom’s role will be to help craft and execute caucus strategy, according to the release. She currently chairs the House Public Safety Policy and Oversight Committee. Hortman, Hosch and Morrow all served as Assistant Majority Leaders last session, when the DFL still had control of the House. Noticeably absent are representatives Erin Murphy and Steve Simon. Both campaigned for the House Majority Leader job before Republicans took control.